The Atlantic Deep is a robust fiberglass pool design. This unique shape takes the form of a funky figure-8 with curved walls and hidden benches. It’s a swimming pool designed for hours of play and even provides an 8′ Deep End for advanced swimmers! Just how far will you go to have fun this summer with your family? Would you travel somewhere exotic like Europe or South America? Or are you more inclined to stay inside of the United States for your summer getaway? Regardless of your decisions on location, it’s important to keep in mind that vacations are expensive and they only last for one to two weeks. Once you return home, you’ll still have the same backyard and it’s likely not the space you’d want to spend time with your family or loved ones. Well, for a fresh idea, why don’t you consider investing in your home and backyard with a fiberglass swimming pool or spa this summer? Instead of spending thousands on a vacation the family will love (for only one week) – why not purchase a complete backyard living space they’ll cherish for years to come? Studies show that people who spend time outdoors everyday (especially by areas with water – a.k.a. swimming pools) exhibit lowers levels of stress. Being around swimming pools reduces our stress hormones and allows our minds to relax at the end of a long day. Swimming pools are also a great space for your family to connect at the end of a long week. Therefore, instead of saving up thousands for a week that slips by and is long gone – why not invest in a backyard that you and your family get to cherish every week? If you’re thinking on the same wave length we are, we invite you to give us a call for a free in-home estimate! We’d love to show you all of the ways that we can boost your family time all while investing in your home (which increases your equity). We believe that memories with your family are made everyday, and we are here to help you create the perfect space to help those memories grow this summer! What is the perfect fiberglass swimming pool to create long lasting memories? Well, you can’t go wrong with our growing list of fiberglass swimming pools! But for this week, we are focusing on the Atlantic Deep! 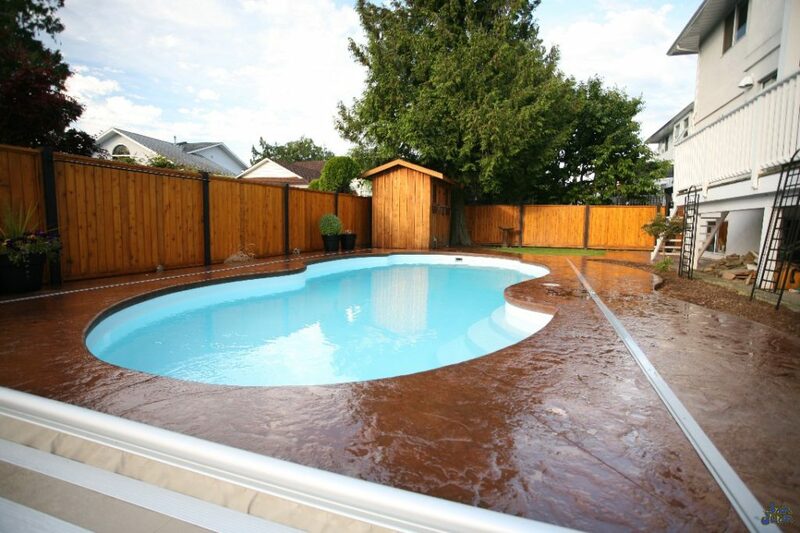 This is a beautiful fiberglass swimming pool with a free form shape and an 8′ deep end. The Atlantic Deep provides a smooth layout to your backyard with a shape that is relaxing to the viewer. It also contains some hidden benches (in both the shallow and deep end). Entering into this stunning oasis is a breeze due to it’s shallow end corner steps. These steps are narrow but lead to a deep basin that is rife with promises of fun and relaxation. You can also find a deep end bench that is both cozy and wide for multiple swimmers to enjoy. This truly is a deep water lagoon that promises enjoyment for all swimmers and a great place to escape the hustle and bustle of life! If you’re an adventurous spirit and are looking for a deep water lagoon to dive into – you’ve found a great option! The Atlantic Deep provides its swimmers with an 8′ Deep End that blends right into it’s free form design. Throw in some dive rings, jump off the edge or simply take a deep water swim. The Atlantic Deep is a splendid option for swimmers who are confident in their athletic abilities! If you’ve been following Fiberglass Pool Guyz for sometime, then you’ll notice that this pool shape looks a little familiar. That’s because it is actually the big sister of the shallow end version: The Atlantic (Shallow). 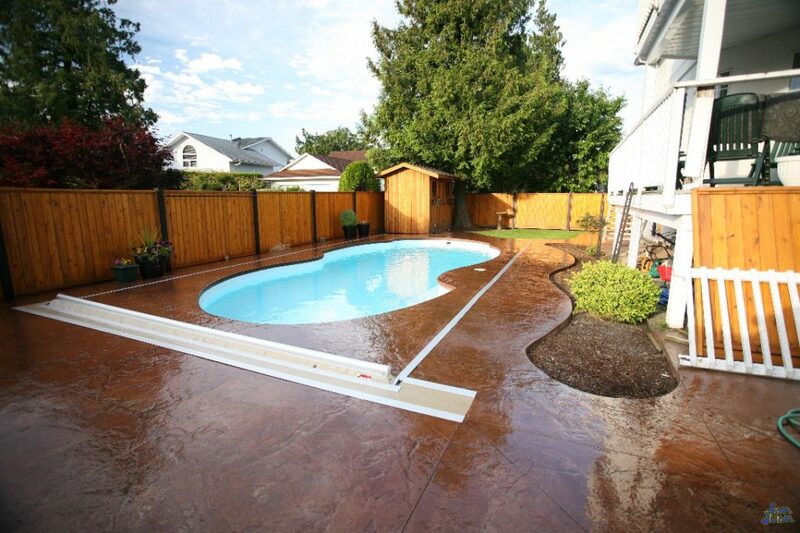 Both swimming pools provide the exact same dimensions and footprint. The only difference between the two is their deep end depths. With that in mind, it’s important to ask yourself what type of swimmers you have in your home. Area your children advanced enough to handle an 8′ deep end? We recommend that each parent focus on safety first and fun second. Additionally, the Atlantic Deep can fit in most medium to large backyards. It requires a maximum Surface Area of only 375 SQFT. That is smaller than most living rooms. To see if this would fit well in your backyard, we recommend grabbing a tape measure and checking the dimensions (listed below) in your backyard. If it fits, it could be yours within a matter of 4 weeks or less! If you’re interested in the Atlantic Deep and would like some more information, just fill out our contact form! We would love to meet you at your home and provide you with more information to help you get started!